Coffee is seen as a drink for mornings, meetings and pick-me-ups. How can it be repositioned? Strong Coffee is a disruption of the coffee market. Research shows that caffeine is highly effective for improving athletic performance across a range of sports, but has not yet been marketed for this purpose. Strong Coffee is pure coffee repositioned for energy seekers. Generic energy drink branding is usually flashy and hypermasculine. Strong Coffee defies these conventions. The visual identity is inspired by clean, premium brands, separating the product from its competitors. 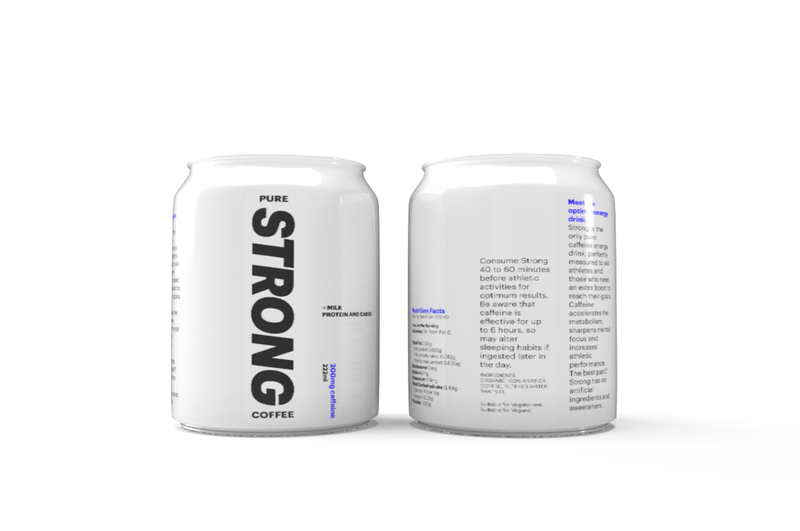 Strong Coffee comes in two varieties, ‘Original’ and ‘Plus Milk’, offering opportunities to explore applications of the brand colourways. Athletes who represent the brand are classic and understated, just like coffee. These champions play a key role in repositioning the product.